If you’re one of those note-takers and list-makers who hoard Post-Its, it’s time to let go. There are still many physical products that have not joined the smartphone era, but 3M’s new app for Post-Its made for a surprising entry into the app store. Even with a slew of digital Post-Its, most users still cling to their physical pieces of brightly colored notes, and clearly, they need a digital solution — a social app made for people-who-like-paper. 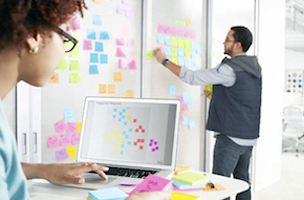 If you’re one of those note-takers and list-makers who hoard Post-Its, it’s time to let go. Download this 3M app, capture your precious notes, and then you can discard (gasp!) all of your handwritten notes. Unless it’s really important and you’re very forgetful, leave the notes, but take photos, because it’s note-insurance. Luckily, it’s very easy to use: Just snap a picture of all your neatly organized notes and the app captures them for digital edits. You can even move them around to make grouped notes before exporting and sharing. Your friends and colleagues can even add to your notes with their own. It’s social note-taking, in the most colorful way possible. Q Is there OCR (optical character recognition) capability in the app? A Currently there is no OCR in the Post-it® Plus App. However Evernote, which provides intelligent search capability, is an export destination. Select PDF as the format and Evernote as the destination and all your handwritten notes become searchable. 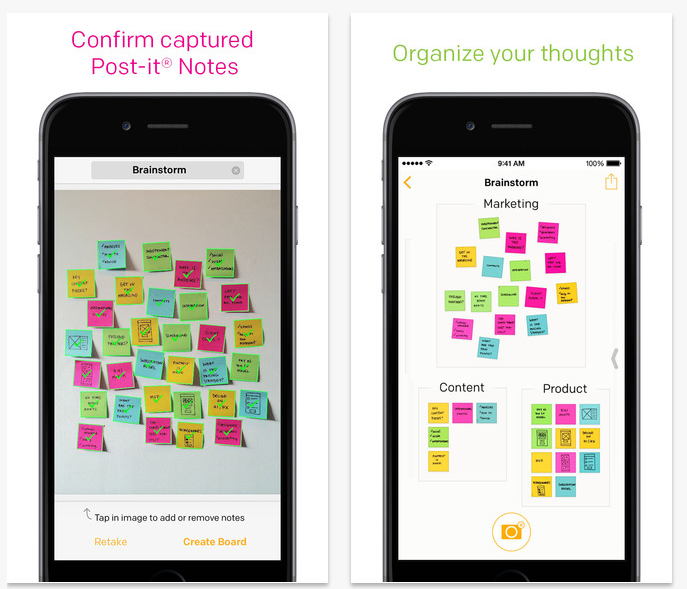 Q Does the Post-it® Plus App work with all Post-it® Notes? A Version 1.0 of the app is optimized to recognize square Post-it® Notes. It can identify other shapes of Post-it® branded products, but the captured note will be displayed as square and you may notice that the content looks squished. Q How do I combine boards? A You have two options. In the Grid View, simply tap “Select” on the top right hand side of the screen. Select all boards you wish to combine, and press “Combine”. Your selected boards will be merged into one. The second option is simply to drag any of the boards in the Grid View onto the board you wish to combine. Q Can I un-combine boards? A No. Better make sure you watch what you are doing. No “take-backs”! Admittedly I’m already a huge fan of pastel Post-Its and all of the associated apps, but I must ask: Is there a plan to introduce a Post-It social network for pixelated Post-It Art? I can’t think of a better way to sell more Post-Its.